At the end of the summer the conversation around the Syrian refugee crisis changed when shocking images of a drowned Syrian boy went viral. Since then numerous videos have appeared that humanize the millions of displaced and dispossessed refugees. The conversation drastically shifted to one around security after the Paris attacks, and has changed again in Canada after Justin Trudeau gave a welcoming response to Syrian refugees. I’ve published a short paper about the crisis where I suggest that improvisation might be one way we can frame a meaningful response to the crisis. The current Syrian refugee crisis—the civil war and the displaced peoples that resulted from it, but also the crisis with respect to how Western countries have responded to it—affirms a renewed need to learn to deal with social dissonance. In this piece, I discuss the ways in which social and musical improvisation (particularly when immersed in the ethics of “cocreation”) can teach us about the merits of creative risk-taking in relation to the current Syrian refugee crisis, a form of social dissonance. Learning to improvise imbues citizens with the important notion that creative risk-taking makes for more exciting and, while unpredictable to a degree, egalitarian societies. Ultimately, I insist that we can fight the insular mechanics of an improvisation of fear with an improvisation of hope that challenges the anxiety that refugees destroy borders and culture, as if these things are pure, static, given, unchanging, and authentic. 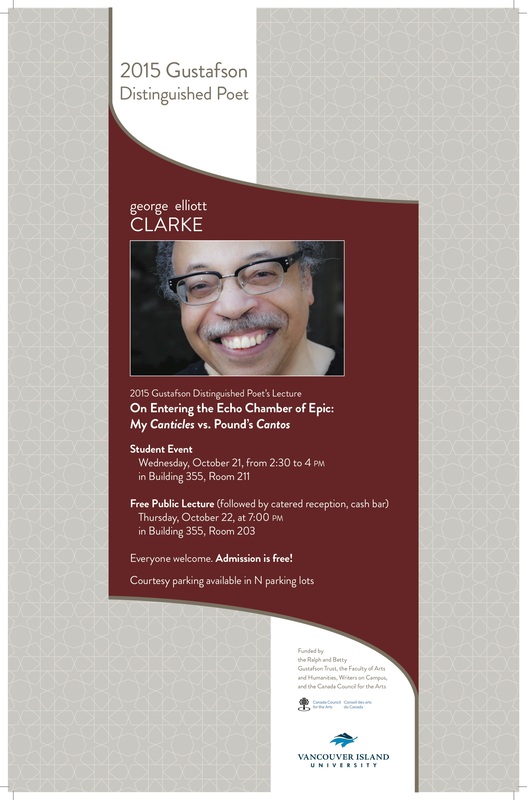 Toronto Poet Laureate, playwright, and literary critic George Elliott Clarke, VIU’s 2015 Gustafson Distinguished Poet, will deliver a free public lecture, On Entering the Echo Chamber of Epic: My “Canticles” Vs Pound’s Cantos, Thursday Oct. 22nd at 7pm in building 355 on the Nanaimo campus. Clarke introduces his epic poem, “Canticles,” in response to Ezra Pound’s contentious Cantos, a 20th-century post/modern epic both vilified for its integration of fascist propaganda and heralded for its haunting lyricism. Pound, a classicist, nodded to T. S. Eliot’s “The Waste Land” and Stephen Vincent Benet’s “John Brown’s Body,” both of which skirted racist material yet refused to be contained, or restrained, by formalism. Clarke has published: a 13 works of poetry including Whylah Falls (2002 Canada Reads contender), Execution Poems, winner of the Governor General’s Award for Poetry, and his latest Traverse; 4 plays, screenplays, or libretti One Heart Broken Into Song, Beatrice Chancy, Québécité, Trudeau; the novel George and Rue; and 4 anthologies of African-Canadian writing including Directions Home: Approaches to African-Canadian Literature. He has been the E.J. Pratt Professor of Canadian Literature at the University of Toronto for the last 12 years and holds 8 honorary doctorates from Royal Military College and Dalhousie, New Brunswick, Alberta, Waterloo, Windsor, Acadia, Saint Mary’s universities. He received the Martin Luther King Jr. Achievement Award, the Pierre Elliott Trudeau Fellows Prize, and Order of Nova Scotia and the Order of Canada. After Clarke’s lecture, a catered reception, cash bar, and book signing will follow in Bldg 300’s Royal Arbutus Room. Several of Clarke’s books will be sold at the VIU Bookstore. Courtesy parking is available in Lot N, in front of building 355. 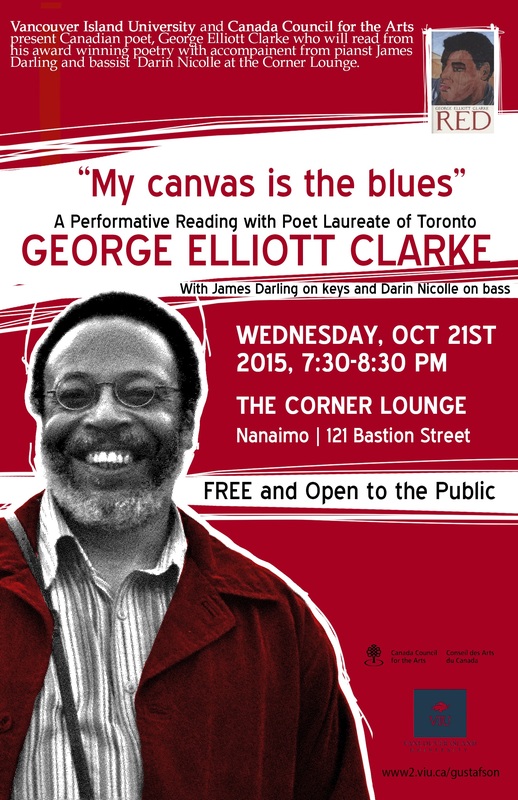 Clarke will also perform with musician James Darling at the Corner Lounge Wednesday October 21st 7:30-8:30. These events are sponsored by VIU’s Faculty of Arts & Humanities, Writers on Campus, and the Canada Council for the Arts. The Gustafson Distinguished Poetry Lecture was established in 1998 from the estate of the late, pre-eminent Canadian poet Ralph Gustafson and his wife, Betty. The Chair has been held by celebrated poets Don Domanski, Dionne Brand, Tom Wayman, Daphne Marlatt, Robert Bringhurst, Don MacKay, Jan Zwicky, Dennis Lee, Michael Crummey, and Katherena Vermette among others, most of whom have had their lectures published as chapbooks. An interview will also appear in Portal2016, VIU’s full-colour literary magazine, on stands in April.